From my hometown Cohocton,NY. 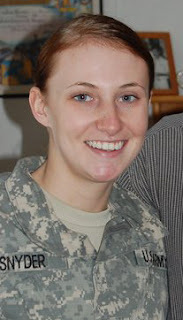 Army Specialist Devin Snyder was killed in Aghanistan on June 5,2011. God Bless the Snyder family and the families of the other fallen soldiers. We will pray for your soul every day. God Bless You and Thank You. "Heavenly Father, during this time of world crisis, let all souls find their peace and security in Your Divine Will. Give each soul the grace to understand that Your Will is Holy Love in the present moment." "Benevolent Father, illuminate each conscience to see the ways that he is not living in Your Will. Grant the world the grace to change and the time in which to do it. Amen." AP Photo/Ann Heisenfelt U.S. Army Chaplain Col. Scott H. Jensen, left, says a prayer as Air Force Col. Joan Garbutt, center, and Army Frocked Brig. Gen. Billy Farris II, right, bow their heads over transfer cases containing the remains of Sgt. Joshua D. Powell, Cpl. Christopher R. Bell, Spc. Devin A. Snyder and Pfc. Robert L. Voakes Jr., during a ceremony at Dover Air Force Base, Del., on Monday, June 6. According to the Department of Defense, Powell, of Quitman, Tex., Bell, of Golden, Miss., Snyder, of Cohocton, N.Y., and Voakes, of Lanse, Mich., died while supporting Operation Enduring Freedom in Afghanistan.